Market neutral strategies have gained attention for their potential to deliver positive returns regardless of the direction of underlying markets. As these strategies have built a record of good performance in recent years, their benefits have become apparent. Market Neutral Strategies draws on the wisdom and experience of professional practitioners to describe strategies that are being utilized by some of today's leading institutional investors. This book provides readers with an insider's view of what makes these strategies work and how they can be implemented successfully. Topics covered include long-short equity and convertibles, fixed income and merger arbitrage; the tax and ERISA implications of market neutral investing; and the failure of two notorious "market neutral" ventures, Askin Capital Management and Long-Term Capital Management. Bruce I. Jacobs (Florham Park, NJ) and Kenneth N. Levy are cofounders and principals of Jacobs Levy Equity Management, in Florham Park, New Jersey. They are coauthors of Equity Management: Quantitative Analysis for Stock Selection. Bruce Jacobs holds a PhD in finance from the Wharton School of the University of Pennsylvania. He is also the author of Capital Ideas and Market Realities: Option Replication, Investor Behavior, and Stock Market Crashes. Bruce I. Jacobs andKenneth N. Levy are Principals of Jacobs Levy Equity Management. Based in Florham Park, New Jersey, Jacobs Levy Equity Management is widely recognized as a leading provider of quantitative equity strategies for institutional clients. Jacobs Levy currently manages $20 billion in various strategies for a prestigious global roster of 50 corporate pension plans, public retirement systems, multi-employer funds, endowments, and foundations, including over 25 of Pensions & Investments' "Top 200 Pension Funds/Sponsors." Bruce I. Jacobs holds a PhD in finance from the Wharton School of the University of Pennsylvania. He is the author of Capital Ideas and Market Realities: Option Replication, Investor Behavior, and Stock Market Crashes and coauthor, with Kenneth Levy, of Equity Management: Quantitative Analysis for Stock Selection. He serves on the advisory board of the Journal of Portfolio Management. Kenneth N. Levy holds an MBA and an MA in applied economics from the Wharton School of the University of Pennsylvania. He is coauthor, with Bruce Jacobs, of Equity Management: Quantitative Analysis for Stock Selection. A Chartered Financial Analyst, he has served on the CFA Institute's candidate curriculum committee and on the advisory board of POSIT. Chapter 1: Introduction (Bruce I. Jacobs and Kenneth N. Levy). Chapter 2: Questions and Answers About Market Neutral Investing (Jane Buchan, Bruce I. Jacobs, and Kenneth N. Levy). Chapter 3: Market Neutral Equity Investing (Bruce I. Jacobs and Kenneth N. Levy). Chapter 4: Convertible Bond Hedging (Jane Buchan). Chapter 5: Sovereign Fixed-Income Arbitrage (John Maltby). 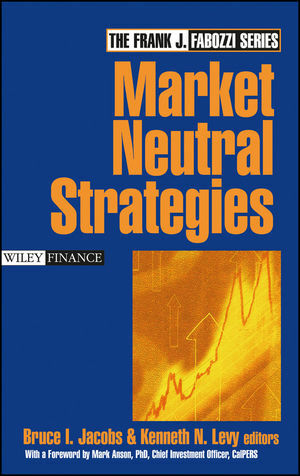 Chapter 6: Market Neutral Strategies with Mortgage-Backed Securities (George E. Hall and Seth C. Fischoff). Chapter 7: Merger Arbitrage (Daniel S. Och and Todd C. Pulvino). Chapter 8: Transporting Alpha (Bruce I. Jacobs and Kenneth N. Levy). Chapter 9: A Tale of Two Hedge Funds (Bruce I. Jacobs and Kenneth N. Levy). Chapter 10: Significant Tax Considerations for Taxable Investors in Market Neutral Strategies (Peter E. Pront and John E. Tavss). Chapter 11: Tax-Exempt Organizations and Other Special Categories of Investors: Tax and ERISA Concerns (Peter E. Pront and S. John Ryan). Chapter 12: Afterword (Bruce I. Jacobs and Kenneth N. Levy).